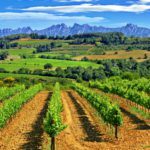 The city of Girona is situated at the confluence of the rivers Ter, Güell, Galligants and Onyar, at an altitude of 75 meters above sea level. Its historical center, or Barri Vell, is one of the most evocative ones of Catalonia, with unique monumental elements in a mixture of styles and periods that make your audiovisual production or photographic shooting here extremely attractive. 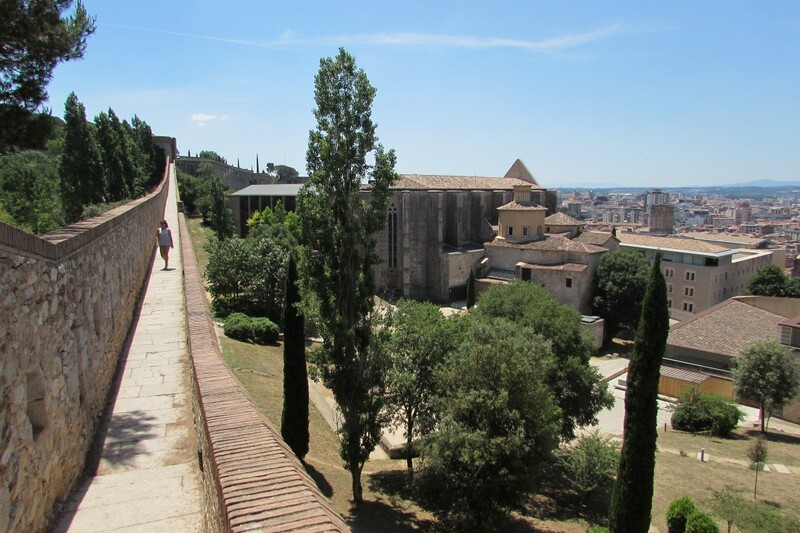 Girona is bounded on the east by the so-called Paseo de la Muralla, the round path of the old walls. Between its monuments we mention the Call Jueu, the old Jewish district, one of the best conserved ones in Spain, as well as the famous and colorful Houses of the Onyar, built on the banks of the river Onyar, and the Cathedral, with a grandiose single nave, the widest in the world in Gothic style. 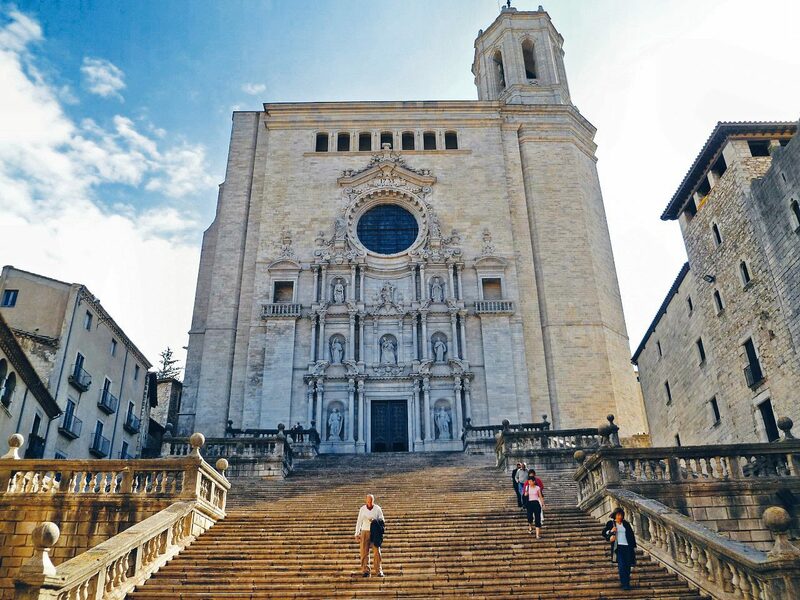 The Cathedral of Girona stands imposing in the Força Vella, the name of the old precinct of the city. At its feet we see a large staircase, a location that will familiar to you through several scenes of the Game of Thrones series. The Cathedral is the synthesis of a great variety of styles, from the Romanesque cloister and the Carlemany tower, to the Baroque façade and the staircase. Next to the Cathedral is the Basilica of Sant Feliu one of the other buildings that makes up the skyline of the city. It was the main church of Girona before the Cathedral was built. 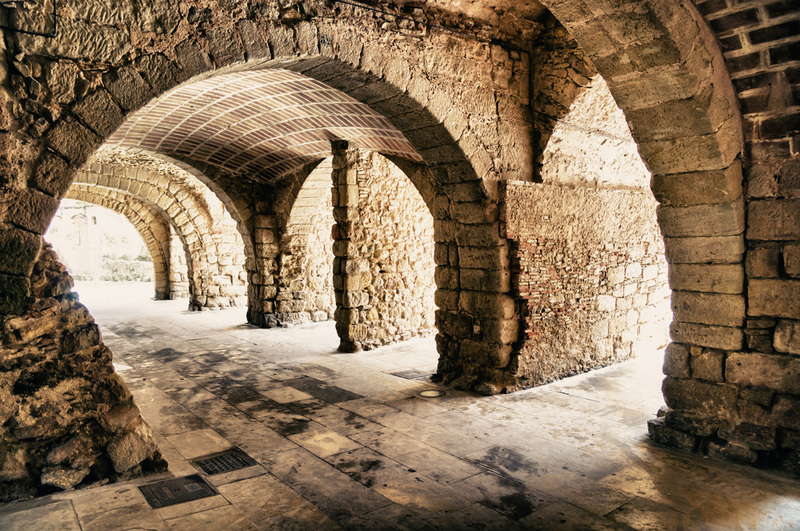 The architecture of the Sant Feliu is also a mix of different styles – Romanesque, Baroque and Gothic. One of the most emblematic areas of the Força Vella is the Call Jueu, formed by a labyrinth of narrow alleys and courtyards that maintains the aura of medieval times. A mystical and tranquil environment for your photographic shooting or audiovisual production. It is one of the best preserved Jewish quarters in the world and an evident sample of the importance of the Jewish culture in Girona. It is a unique Romanesque construction inspired by Roman baths and its most admirable elements are the room of entrance, destined to wardrobe and rest room, covered with an annular vault, and the dome that, seated on fine columns with beautifully ornamented capitals, crowns the central pool. These baths, where you can locate your audiovisual projects, were built in 1194 with a structure that imitated that of the Muslim baths. 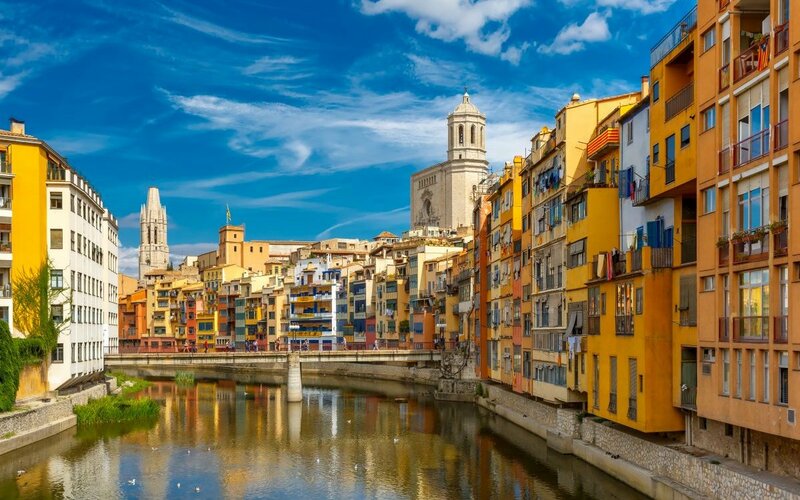 The Onyar houses are painted with bright colors and, with the Cathedral and the Sant Feliu in the background, are they the most emblematic image of Girona. 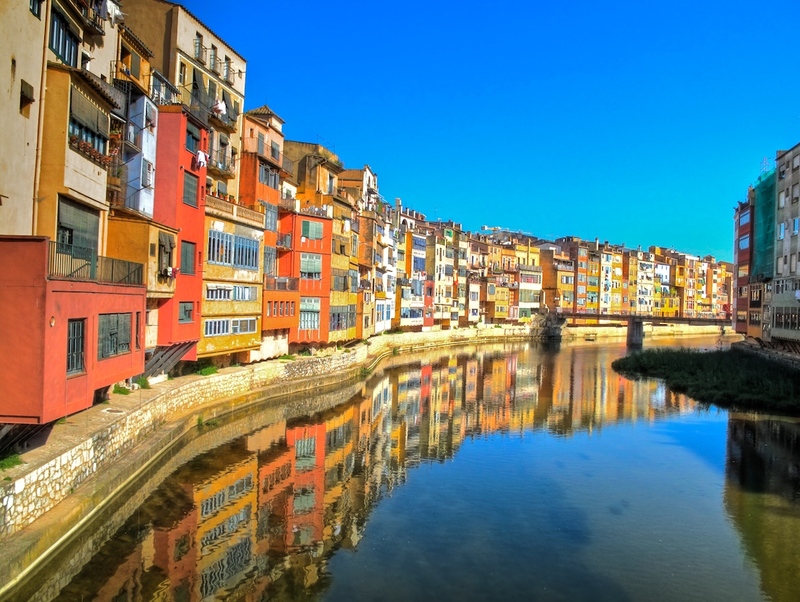 The facades of these also called “river houses” or “hanging houses” are overlooking the Onyar River, between the Rambla and the Ballesteries Street. Originally they were built on the medieval walls. A characteristic background of the city for a photographic shooting or audiovisual production. The extension of the Romanesque walls in medieval times allows us to walk today along the old path the Paseo de la Murella, through the most extensive sections of the walls. The various towers that crown it are authentic privileged viewpoints over the city and its surroundings. 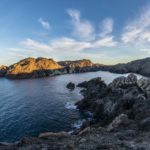 Spectacular views to locate your next audiovisual project. 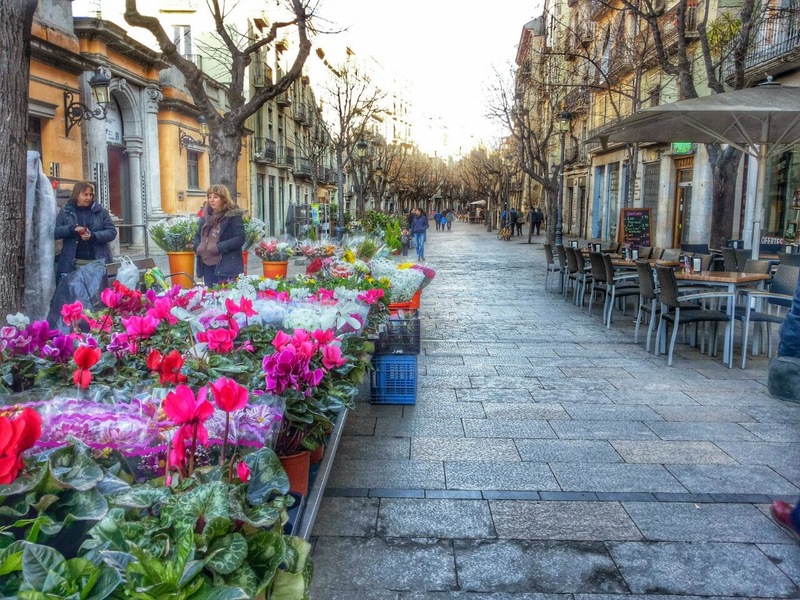 La Rambla is a magnificent elongated space parallel to the Onyar River that has become a commercial and leisure center of the Ciutat. One of its most characteristic elements is the arcades, with low ceilings and uneven arcades. It is interesting to look up to the ceilings to discover some of the secrets that are hidden there, a very lovely capital or an old map of a European capital, for instance. Will you find them for your audiovisual production or photographic shooting? 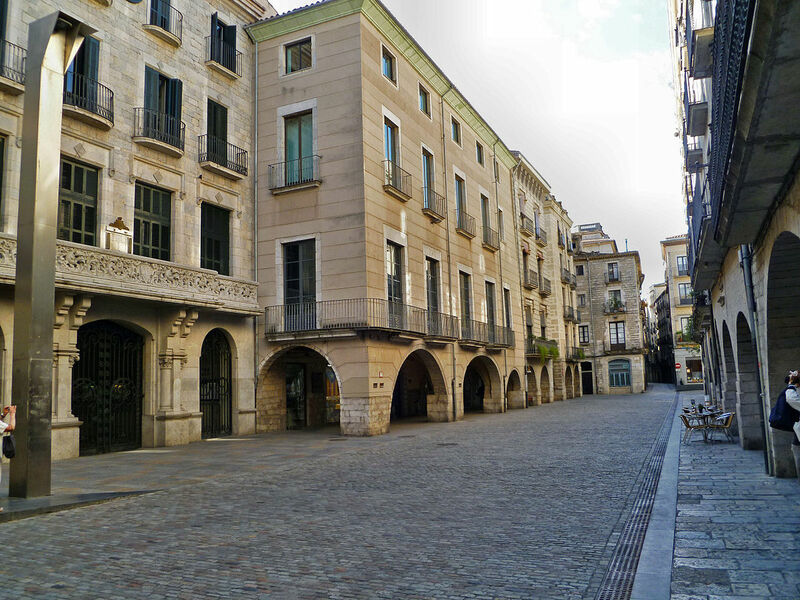 The Plaza del Vi, which houses the City Hall of Girona, is surrounded by arcades with shops and terraces. 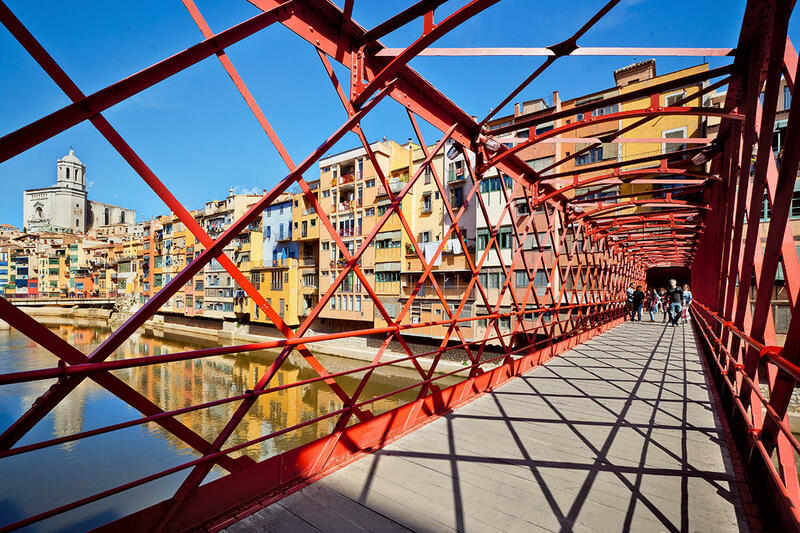 Nearby are several bridges from where you can enjoy the postcard of the Onyar houses. The square had historically been the residence of noble families, so it has a stately character. Is it what you need for your next audiovisual project? The buildings with arcades are very beautiful and have witnessed large concentrations of people during demonstrations and parties. 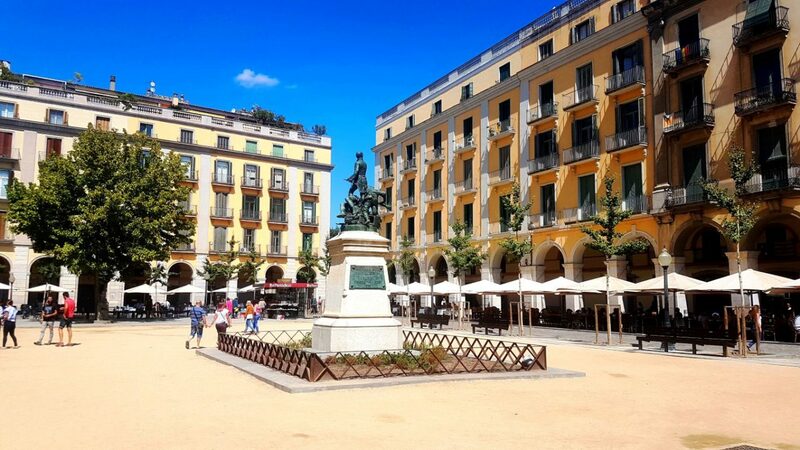 This is one of the busiest squares in Girona with a great atmosphere. It is surrounded by arcades full of restaurants and terraces. Until 1835 there was the convent of San Agustin, but the square was rebuilt and now all the buildings have the same façade, in neoclassical style, of a nice yellow color. A very harmonious background for your audiovisual production or photographic shooting. The Pont of the Peixateries Velles is one of the most representative and busiest ones in the city and owes its name to the fact that fishmongers settled in this area for several centuries. It is a lattice metallic structure of 3.50 meters of ridge, with a length of 41.50 meters. The pavement of the bridge is at an approximate height of 7 meters, compared to the riverbed, and its width is 2.62 meters. The structure of the current bridge was built by Gustave Eiffel’s Eiffel et Cie. Company in 1876, ten years before the constructions of the Eiffel Tower in Paris. A peculiar location for your audiovisual production. The Devesa de Girona is the authentic green lung of the city. 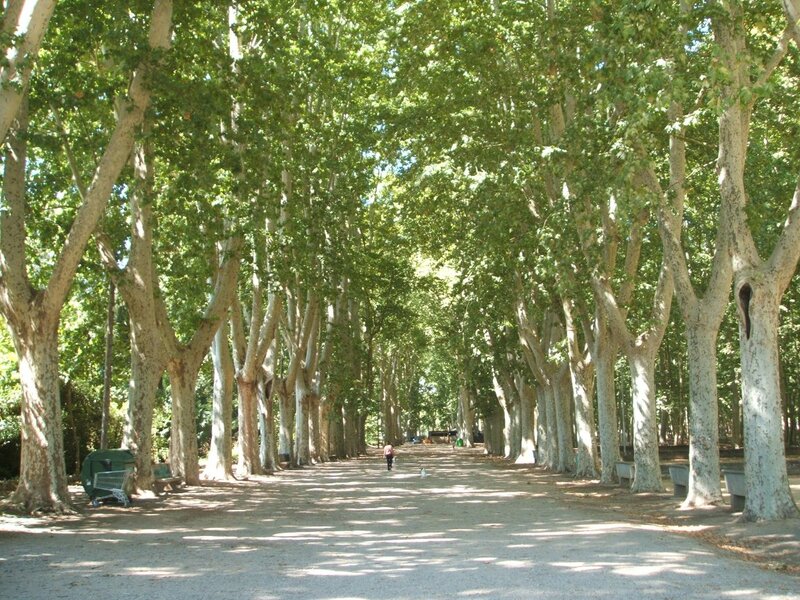 It occupies 40 hectares and is one of the largest urban parks in Catalonia. It counts more than 2.000 trees over 100 years of age, with exceptional heights. They are placed aligned so that they create various walks in the shade. The Devesa has also at one end gardens with plants and flowers of different species. An oasis of peace and tranquility for your photographic shooting or audiovisual production.